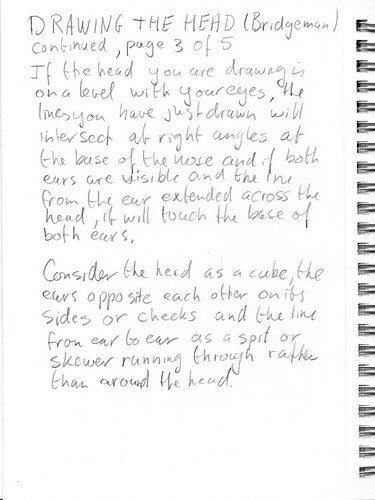 In the book “The Complete Guide to Drawing from Life” by George B. Bridgman, there is a description of how to draw the human head. 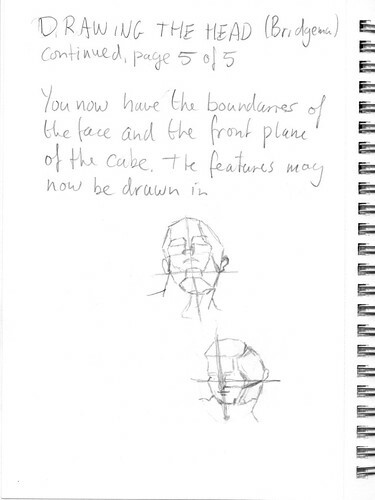 It gives a recipe of how to draw the general outline of the head and where the main feature should be drawn, based on your observation from a life model. These five pages are my personal notes, and not meant as a tutorial for others. This blog is aside from to show others what I have done also a place to put personal note, so I can easily find them back later. I will study these notes thoroughly and will apply them to the Unknown Faces project tomorrow. 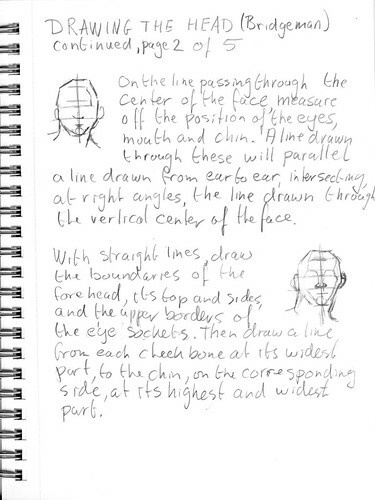 After I didn’t really succeed in drawing a portrait from a photo on Flickr, I decided to study how to draw the human head. 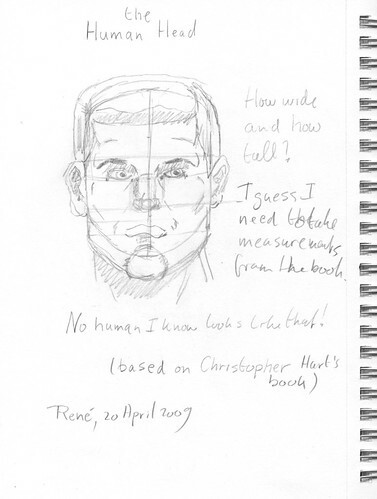 I started with the obvious book by Christopher Hart (translated into Dutch) about anatomy, which starts with drawing the front view of the male head. 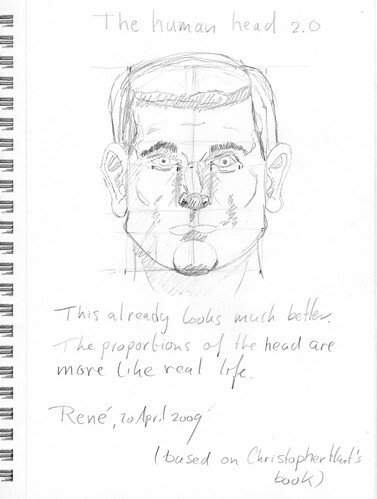 The obvious problem I encountered was that I didn’t know or could guess with enough accuracy how wide the face is compared to the height. The illustrations in this book gave no clues. So I decided to copy the dimensions of the illustrations into my own sketch (by measuring it in the book between the tip of my pencil and my index finger. Because I had to resort to that, this method seems to me to be a bit forced. It may be good enough for some, but I need a little bit more explanation. 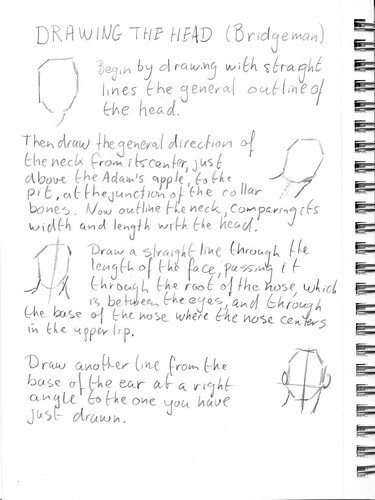 Luckily, I have more books about drawing, and some of those also describe how to draw a human head. I will work through those, then return to this method by Christopher Hart and see if it makes more sense after I’ve done that. Drawing can be plain awful and just frustrating at times. However, I know from personal experience those are the times I need to continue drawing and go through the process of reaching the next level. The reason I’m frustrated is often because I have reached a plateau I simply need to break through to advance. I think If you give up and accept you’ll never draw any better than this, you’ll never give yourself a chance to find that crack in the ceiling that enables you to slip through and reach the next level. I think this is one of the reasons why learning how to draw is so personal and no learning methodologies exist that are applicable to all. It is a highly personal journey with highs and lows. Other people can only give you advice, but never tell you how to do something in any exact manner. You simply have to find out for yourself what works for you. 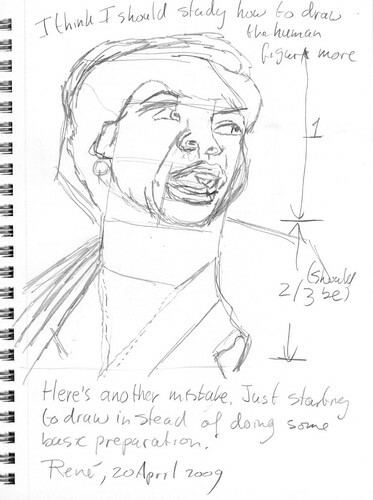 So I had problems with the pose of this woman in number 66 of Drawing Unknown Faces. Her head was tilted slightly backwards and I tried to drawing some help lines on an egg-like shape standing on its pointy side, which a head can be seen as. 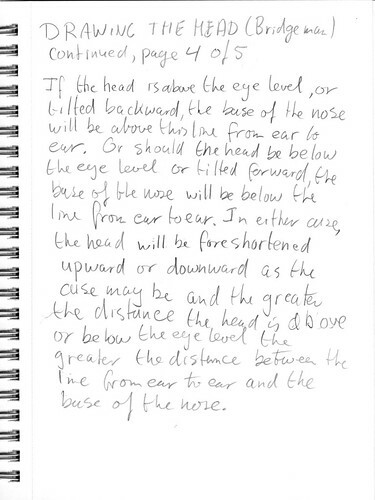 However, how do you find out which direction the egg is pointing? D’oh, by looking which direction the pointy side is going, or, in other words, which direction the chin is pointing. 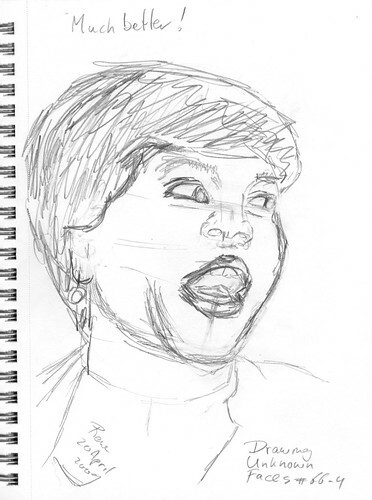 This obvious notion was apparently oblivious to me when I started making the following sketch. This was not how the reference photo looked. The chin pointed in the wrong direction. Fourth try, and this time I had figured out most of this pose and drew a pretty good representation of the reference photo, although the anatomy of her face still puzzles me. I really have to study that anatomy book by Christopher Hart. So in evaluation it didn’t make the kind of sketch I had in mind, but I guess it will have to do for now. Some poses are just hard to draw, that’s for sure. Why am I having such a hard time drawing unknown faces? 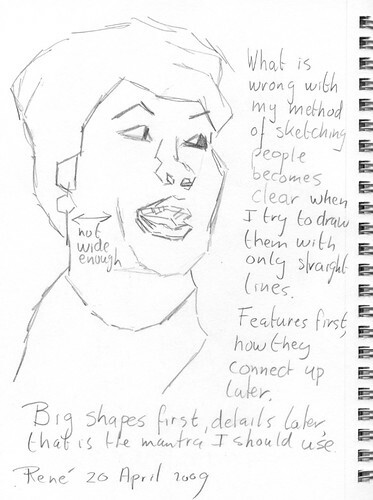 I was wondering why, at times, my faces turn up so distorted and unlike the photo I’m using as a reference. To study my flaws, I decided to draw a simplified version of a sketch, with broad and straight line pieces. Here’s how a face turns out when I just start drawing without any plan. So I should be drawing big shapes first and fill in the details later. So I tried that in the next sketch. It turns out that I don’t have enough basic knowledge about how to draw the human face. Not that this is any surprise to me, but actually it should have prompted me to study human anatomy earlier. 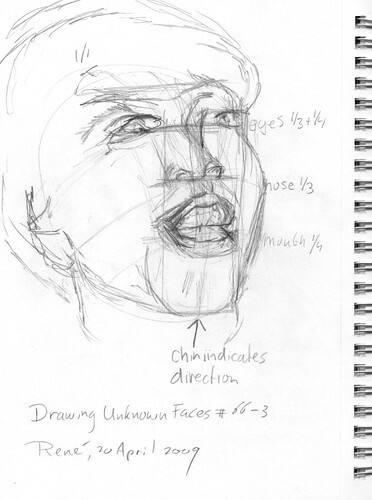 I’ve been slavishly drawing these “Unknown Faces” for much too long. I should have realized much sooner than I’m in need for some superior knowledge. So I’m going to do that for a while, dabble in human anatomy, trying to figure out how to draw this woman more realistically. I know that’s not what art is supposed to be about, but there is the urge in me to do something beyond artistic expression, to become a craftsman at drawing, and not just someone who expresses his emotions and inner thoughts in a visual form. Perhaps a bit dated (TED Talk 2008), but still very entertaining is this TED Talk by David Pogue.